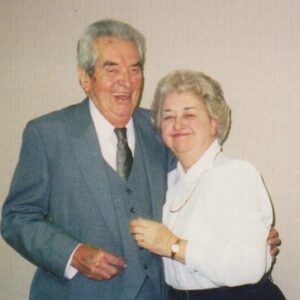 Helena Anne “Mickey” McKniff was born in Forge Village in 1928, the only child of Thomas John McKniff (1901-1981) and Sarah “Sally” Lavelle (1898-1984), who were both born in Keighley, Yorkshire, England. Thomas came to America with his family in 1909. Thomas, his parents John Joseph McKniff (1867-1938) and Hannah (Emmott) McKniff (1871-1928), and his seven siblings sailed from Liverpool, England on November 3, 1909, on the S.S. Cymric of the White Star Line, arriving in Boston Nov. 12. John and Hannah would have three more children in Westford. With them on this trip were Thomas and Catherine (Byrnes) Finn and seven of their children. They had one more child after moving to Westford. Mickey’s mother, Sarah Lavelle, was the daughter of Michael Lavelle, born in Selby, Yorkshire, in 1855, and Ellen Rowan, born in York, Yorkshire in 1857. Michael died before the 1911 census. Sarah’s sister, Mary Ellen Lavelle (1896-1986), also born in Keighley, married Thomas O’Neill and also came to Westford. The Cymric (13,096 tons) made its maiden voyage from Liverpool to New York in 1898. She made regular trips between these two ports until 1904 when she started sailing between Liverpool and Boston. She was used as a troop ship sailing between England and South Africa during the Boer War in 1900. In May 1908 Westford’s Donald Cameron family sailed to Britain on the Cymric where they took a motor trip through England, Scotland and Wales. They returned to Boston on the Cymric in July. In August 1908 William Venn returned from a trip to England on the Cymric and in November his wife and two sons also returned on the Cymric. In October 1910 “Mr. and Mrs. Philip Sexton sailed Tuesday on the White Star liner, Cymric, for Keighley, England. Mr. and Mrs. Philip Sexton came to this village shortly after their marriage two years ago, but failed to settle down,” per the Westford Wardsman. The Thomas Finns returned to England on the Cymric in August 1911, but they would return. When World War I broke out in 1914, Cymric reverted to her Liverpool-New York route. On May 8, 1916, while sailing from New York and while off the coast of Ireland, Cymric was hit by three torpedoes fired from the German U-boat U-20, the same U-boat that had sunk the Lusitania on May 7, 1915, also off the coast of Ireland. The Lusitania was also a White Star Line ship. John’s parents were Michael McKniff (c. 1816-1883) and Mary Conway (c. 1828-1905). Both were born in Co. Sligo, Ireland, and died in Keighley. They had eight children, the first five being born in Cloonbarry, Co. Sligo, and the last three in Keighley. John James McKniff was the sixth child and the first born in Keighley. Hannah’s parents were William Emmott (1837-1896) and Sarah Coulton (1837-1884), both born and died in Keighley. William’s Emmot ancestors had lived in Yorkshire at least since his great grandfather was born in Bingley about 1762. Sarah’s parents were also natives of Yorkshire, and her father was also born in Bingley, located on the River Aire about halfway between Keighley and Bradford. 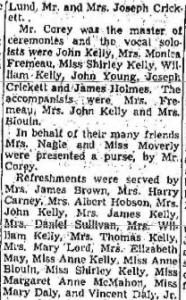 The children of John and Hannah (Emmott) McKniff married into the following families: Costello, Blott, Conroy, Molloy, Lavelle, Hulslander, Hammond, Crowley, Stapell and Connor. Most of the family stayed in the Westford area and many are buried in St. Catherine's Cemetery, Graniteville. In 1953 Mickey McKniff married Leonard Eaton Crocker (1927-2001). They had eight children, two of whom are deceased.